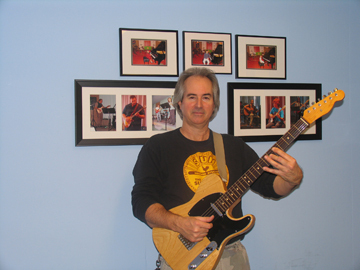 Best Music Instruction in the South Bay Our dedicated professional music teachers have college degrees in music and/or years of professional music experience performing, recording and touring. Listen to our growing list of video clips from teacher and student performances and it should be obvious - music teaching and performing is what we do best! We love what we do, and we keep attracting more and more students who feel the same way. After his first recording at the age of 17 with Shirley Bassey, Gary began touring in the mid-70's with Etta James, Olivia Newton-John and Cher. Since then, he has also recorded and toured with Les Dudek, Eddie Money, David Benoit, Gary Moore, Charlie Sexton, John Hiatt, Glenn Hughes, The New Radicals, Steve Lukather, Edgar Winter, and Larry Carlton. He has also worked with Stevie Nicks, K.D. Lang, Hoku, Susanna Hoffs, Willie Bobo, Ray Charles, Billy Preston, and many others. In 2000, he performed on the Women Rock Lifetime television special, featuring Sheryl Crow, Emmylou Harris, The Dixie Chicks and more, as well as many film and jingle dates. Get the latest schedules and information about upcoming student recitals, concerts, jam sessions, community involvement, job oportunities and more sent straight to your inbox. It's easy and it's FREE! We respect your privacy! We will never rent or sell your e-mail address to any third parties. Call (310) 540-6767 and Andrya will be happy to answer you questions. Click here to get our FREE South Bay School of Music newsletter for prospective music students. We will never rent nor sell your e-mail address to any third parties.